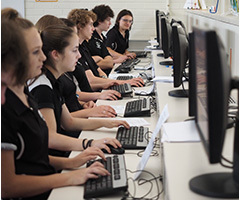 Canberra High School is connected to the ACT Government managed SchoolsNET computer network. This network connects all ACT Government Schools to a bank of centralised servers off-site. Schools are connected to these servers through the ACT Government Fibre Optic Network. A student will be granted access to SchoolsNET when a "Code of Practice for Students" form is signed. Once access is granted, students will have access to a number of network drives as well as the internet. All students will have a personal H drive that is only accessible by them, no one else has access to this drive, including teachers and IT staff. There is also a shared drive - T (teaching) where teaching resources can be made available for students. The student logon is their Central ID number, this is a 7 digit number that they maintain throughout their school experience. It identifies them uniquely within the ACT Government Education system. Their password is unique and once set is the responsibility of the student to maintain. Password complexity is quite high, with a minimum of 8 characters, including a capital letter, a number or special character. 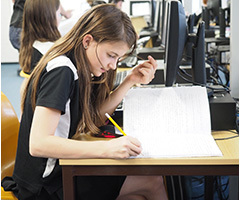 Due to the centralised nature of the network, password resetting is not a simple process so students are encouraged to create one that is secure and easily remembered. Students will have automatic access to the Internet once their acceptable use form is signed and the Internet use box is ticked. All SchoolsNET computers have Content Keeper internet filtering set at an appropriate level for high school students. This is managed by the ACT Government. 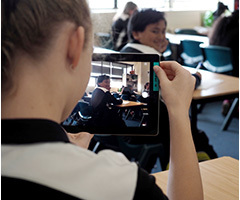 Google Apps for Education (GAFE) is being rolled out at Canberra High School and provides students with access to modern learning tools to support their education, including student email. Parent permission is required for students to use GAFE. When a student has parent permission to use Google Apps for Education, they also obtain a school g-mail account. The email account is linked to their student ID number. Canberra High School has a large number of desktop and netbook/laptop computers primarily running the Windows operating system. These resources are located in 5 computer lab situations and 9 mobile trolleys for the portable devices. Specific subject areas also have a number of Mac and iPads with more specialised software being available for students to use.